Welcome Tipnut readers! You sure have come from one of the handiest sites on the web! I do hope you’ll enjoy Southern Plate. It is great to have you here! Y’all said you wanted quick and easy meals and I’ve been listening! I am going to try to post one quick meal idea each week. This week that has come in handy for me as well as I work on creating a better index for Southern Plate and Slideshows for each category. I’ve finally figured out how to get it all done but its just taking some time. I’ll have a slideshow for every category on the sidebars and when you click on the title of that category, it will take you to a page which lists every dish in that category (Each name will be clickable to take you directly to that page and even though clickable is not technically a word in the real world, it certainly is on Southern Plate though, because I said so). Whew! Now that I’m done with my rambling, let me show you the world’s easiest supper. This supper is also awfully darn tasty! My son ate three bowls! I first made this soup about ten years ago (oh lord, that makes me feel so old!). We instantly fell in love with it. Even if it weren’t so incredibly quick and easy, the flavor would have won me over on its own. You’re just not going to believe how great this tastes! 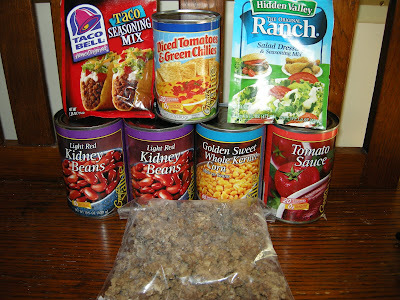 You’ll need: 2 cans kidney beans, corn, Ro-Tel, tomato sauce, 1 package Ranch dressing mix, 1 package taco seasoning mix, and about a pound of beef (more if you’d like). I cook my beef ahead of time and freeze it in individual meal sized portions so I just grabbed a bag from the freezer, which makes this even easier! You ready for the instructions? Dump it all in a pot. Don’t even drain your cans, just dump it all. Add a cup and a half of water and stir. Bring it to a boil then lower the heat and simmer for fifteen minutes. Serve! I like to eat mine with sour cream and cheese. You can use your favorite add ins or just eat it on its own. Combine all ingredients, bring to a boil and then simmer for fifteen minutes. *Just dump in cans, liquid and all! Fall TV is underway, have you found any shows that you particularly like? If so, I’d love to hear about them! In the comments section, tell me what shows you like, what networks they come on, and what day and time! So far, all I am watching is Army Wives on Lifetime and True Blood on HBO (I just love Sookie!). Those both come on Sunday nights and I’d love to know of something good that came on another night but I never actually watch network TV during the day (It’s all Noggin or Disney Channel here!) so I don’t get to see previews or commercials about anything to know! 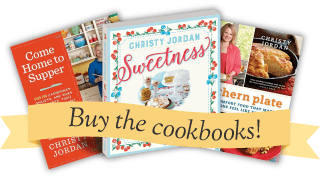 Thank you so much for reading Southern Plate! I’ve got lots more in the works for you so come back often and sit a spell! Yum! I’m all over that soup for dinner tomorrow night. Hubby will be at the office late and who knows when he’ll come in hungry. I don’t watch a lot of television either, but my two favorite shows are Bones and The Closer. Pushing Daisies will be starting up a new season soon, too. Good Morning Christy, Taco Soup is one of my favorites. Hopefully the weather will cool down some so i can make it. Nothing like haveing a hot bowl of soup and its 90 degrees outstide. I dont watch to much tv mostly disney, noggin and spongebob due to the kids. But my favorites are Greys Anatomy, E.R. and Brothers and Sisters. They took ofr October Road I loved that show! 🙁 I think they were all ABC shows. Sorry my comment showed up twice. I love taco soup! This is close to the recipe that Paula uses. I throw some pasta in to make it last longer. The Office is the best show ever! NBC thursday nights at 8. Taco Soup! One of my favorites. Thank you maam. The shows I love are The Cleaner with Benjamin Bratt, In Plain Sight, Monk and Psych. Most of the time I watch TCM because I get tired of the trash on TV. Gimme the classics any day. Katherine Hepburn, Cary Grant, Jimmy Stewart..I wish they were still around. Have a great day Christy! Hi Christy, This soup looks so wonderful! It would be perfect for working moms I think. The best thing is, most people have all those ingredients on hand all the time. Your recipes are always like that and thats why I visit here so often. Love Love Love it. I mentioned you on my blog! Please go take a look. Hey there. This sounds yummy. What could I use in place of the rotel. I would eat it but my mil has stomach problems when it comes to spicy food. I make a white chili that our family loves. I love taco soup too! I make it a lot on the weekends. I love your recipe site too….it's the first place I come when I get online. I'm all about easy so I'm excited about that. Also your recipes are kid friendly. My daughter and her three kids live with us so I have to cook food that the kids will eat. Yum! Considering any type of mexican dish is our favorite, this will be a wonderful dish for our fam. April is not a big soup eater except for chili and homemade beef soup, but she’ll love this. Yummy!! and warm for October!! Thank you for your site – there are so many things here that I can cook! My mom likes to teach me but she doesn’t use measurements and I NEED measurements so this helps me so much!! This is my all time favorite thing to take to new moms that just had babies. My mommy group calls it ” STORKING” when you take a meal to the family each night so they can spend more time focused on the new baby instead of cooking. TACO SOUP IS A HUGE HIT! So simple to make …so yummy in summer or winter time. We serve it with sour cream, cheese and some chips. YUM YUM! That looks really yummy. 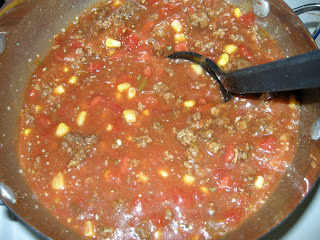 I love taco soup, and your looks so delicious and easy! Sort of a side note: You know what makes a good topping for taco soup? Take some tortillas and cut them into thin strips, then toast them in the oven. Voila – you’ve got crispy tortilla strips that go perfectly with taco soup. This will definitely be made this week, and who doesnt love “dump it in the pot, and simmer for 15 minutes” after a long day at work? My favorite shows are Extreme Makeover: Home Edition (tear jerker for me) and Big Bang Theory. Hey, pretty lady! I’ve got something for you on my blog! I made this for supper last night. There is about 1 bowl of it left in the fridge. It’s now on the list of “make it again” dishes I have tried out on my roomies. One of em said, “its a soup, looks like chili, and tastes like a taco”. They were both impressed at how little effort it took to throw together. Thanks again Christy. Im not sure how much easier you can make supper, but I bet ya got a trick or four up your sleeve. I’m a Southern girl relocated to Ohio…it gets cool up here…this evening I made your soup and it was a hit with my Hubby. i make this in the oven with a layer of masa over the top..It is wonderful on those cool fall evenings..I love your recipes.Keep them coming…. My niece and nephew stay with me after school and on Wednesday nights they have church youth group. I think I will make this Taco Soup next week for everyone. 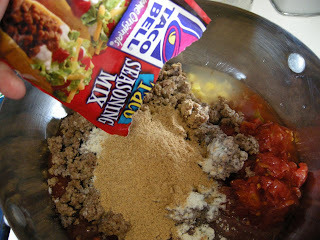 I love Taco soup, but your recipe is so much more simple. As for Fall shows, I watch all of the ABC shows and ER. Also started watching the new show on CBS called the Mentalist. It’s pretty good. Excellent soup Christy!! Looks great dn very simple. I love it! I’m going to try this when I get a few more ingredients. 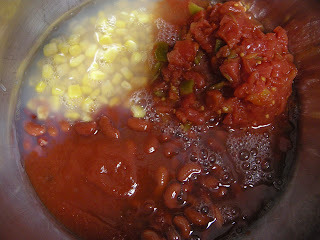 But I’ll have to make a few changes, because I can only tolerate small amounts of insoluble fibers: Change the kidney beans to Pinto (less insoluble, more soluble than kidney beans), and the corn to hominy because the kernel skin is removed, which is a bummer, because I prefer the taste of regular corn to hominy, but they cause me so much pain I have no choice. It seems I’m getting pickier and pickier about TV shows over the years — is it because I’m getting older, or are most TV shows just becoming cheap imitations of other popular TV shows? Anyway, True Blood is the only new show this season that I’m still watching. Returning shows I still watch are: Desperate Housewives, Heroes, Supernatural, Boston Legal, Dexter, and eventually Lost and 24. I’m thinking about buying earlier House seasons, and will give Bones a try, because they seem to have a big following. But no promises, because there’s lots of shows with big followings I can’t stand: DWTS, Survivor, Grays Anatomy. I came from TipNut, but am subbing because you have buttermilk biscuits and chocolate gravy, cornbread, and icebox pie (banana pudding). 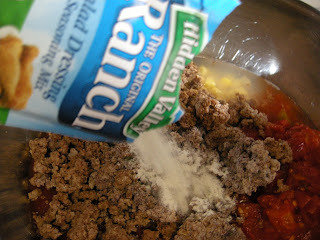 I’d like to try this but substitute something for the Ranch dressing, as I try to stay away from packaged stuff. What would be an acceptable substitute? This sounds and looks absolutely delicious! If I hadn’t made a pot of chili yesterday, I would do this today. But I definitely will try it later in the week. Thanks for sharing! This is an all time favorite. Thanks for the recipe. I had lost mine and couldn’t remember all that went into it. My husband made this soup over the weekend and it was wonderful! It’s almost gone in only 2 days. This is one of our favorite soups! We’ve been loving it for years and share it with all of our friends! Great recipe sharing. I made this last night for company. He is a really ticky eater and doesn’t like anything that isn’t “American” food. He ate 3 heaping bowls full of this served over fritos. He loved it and so did his wife. Thanks for sharing it with us. I can’t wait to make this Taco Soup, but wondering…how much does this recipe make? I need enough for 12 people, should I double it or leave it as is? Thanks soooo much….LOVE this site and bought your cookbook which has the BEST recipes!!! 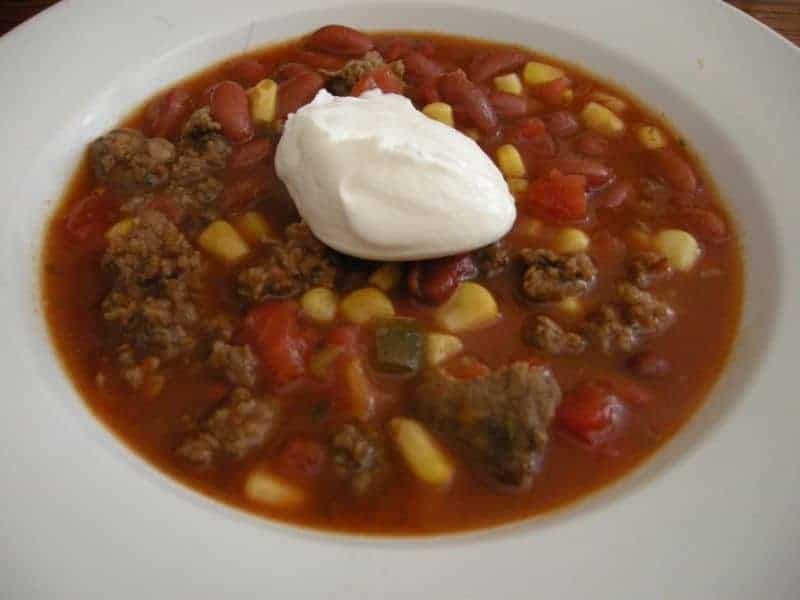 It’s BRRRRRRRRR here in Iowa, so this soup sounds mmmmm good!!! Such garbage…my god! You people eat this crap? Seriously?? ?